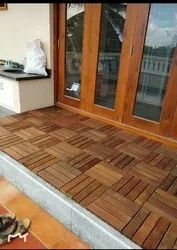 Pioneers in the industry, we offer outdoor deck flooring for restaurants and ipe wood deck tiles from India. Backed by a team of professionals, we are occupied in offering premium assortment of Outdoor Deck Flooring for Restaurants to our clients. Moreover, client can purchase the provided flooring from us at very moderate costs. Looking for Outdoor Deck Flooring for Restaurants ?